is back on the market. OAKLAND CITY COUNCIL | Chalk another one for Oakland’s populist movement. The controversial East 12th Street remainder sale approved by the Oakland City Council last month “quietly” passed into the darkness this week. In closed session Tuesday, the City Council decided to rescind the proposed sale, according to the San Francisco Chronicle, and also put the nearly one-acre Lake Merritt property back on the market. Earlier this month, just a day before the second and final reading of the ordinance was due, a memo obtained by the East Bay Express, noted Oakland’s city attorney had warned about the illegality of the $5 million sale under the state’s Surplus Lands Act. 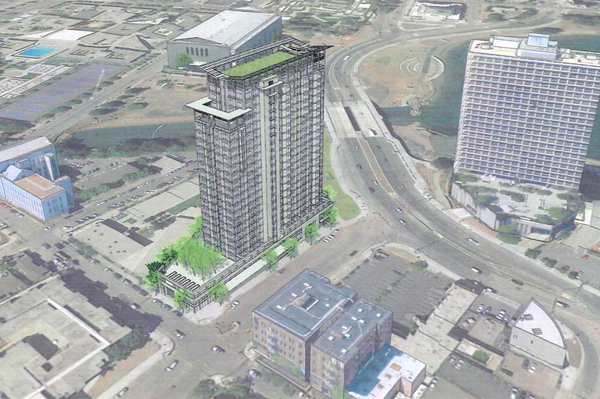 The East 12th Street remainder parcel was proposed to feature a 24-story luxury apartment building, but without an affordable housing component. The lack of the latter features potentially made the sale illegal under state law, said City Attorney Barbara Parker. Councilmember Dan Kalb repeatedly voiced uneasiness about the legality of the sale throughout the deliberation process and ultimately abstained. Councilmember Noel Gallo, registered similar doubts, but later voted in favor. But Thursday’s developments represent yet another populist victory by local activists. As a group, vocal Oakland residents have turned back a citywide surveillance program, held the banner for raising Oakland’s minimum wage and now have blocked what many described as a very bad deal business deal for public land potentially much more valuable than the $5 million asking price. Posted in Barbara Parker, Dan Kalb, E12th Street remainder parcel, Lake Merritt, Noel Gallo, Oakland, Oakland city attorney, Oakland City Council, populism, surplus. Bookmark the permalink. Government, and extra especially in the Bay area, is full of creatures who “know” that they are so extremely “intelligent,” “ethical,” and “wonderful,” that therefore they can always be trusted to do what is best for the general public, so therefore obviously we members of the general public have nothing to fear from them and their illegal secret meetings, backroom fixes, and sleazy deals. To give just a few examples of the wonderful, extremely intelligent, and totally trustworthy creatures who in recent years have infested East Bay government, let me mention Mary “Brain Tumor” Hayashi, Nadia Lockyer, Shawn Wilson, and the Berkeley city government employees who have been in charge of inspecting balconies.